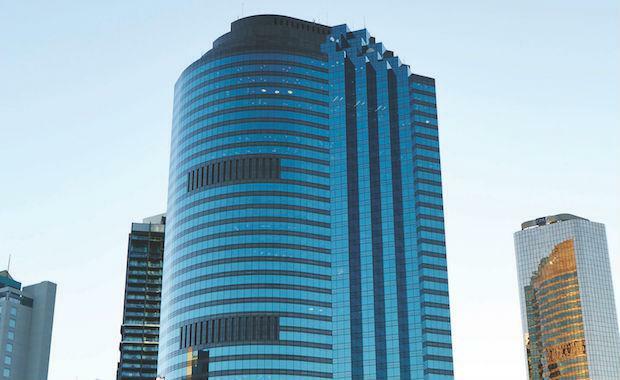 Brisbane’s iconic Waterfront Place office tower is to be offered for sale - presenting the first opportunity since 2009 to secure a 100% interest in an existing premium grade Australian office asset. JLL will jointly manage the international Expressions of Interest campaign, which is expected to result in one of the largest Australian office transactions for 2014. The campaign will be steered by Bruce Baker, Flint Davidson and Michael Andrews for CBRE, alongside Geoff McIntyre, Seb Turnbull, Rob Sewell and Simon Storry from JLL. generate extremely competitive buyer interest"
The building is to be offered for sale on behalf of joint owners the Future Fund represented by CorVal and Stockland. “As one of only 35 premium grade office buildings in Australia and one of only four in Brisbane, Waterfront Place is an extremely rare commodity. There is significant pent up demand from both offshore and onshore groups for office investment opportunities and given the scarcity of available stock, we expect the opportunity to secure a 100% interest in an investment of this magnitude will generate extremely competitive buyer interest," said CBRE Senior Managing Director, Queensland, Bruce Baker. Mr Baker added that the Brisbane investment market was continuing to attract an increasing number of international investors, as highlighted by recent major transaction, including the first acquisitions in Australia by groups such as Union Investment at Southpoint, Credit Suisse at Elizabeth Street and PNB’s acquisition of Santos House. “The yield differential between Brisbane and markets such as Sydney and Melbourne and international cities such as Hong Kong and Singapore is one of the attractions and this will help drive strong domestic and international buyer interest in both the Brisbane market and Waterfront Place,” Mr Baker said. Waterfront Place is a premium grade, landmark riverside property located at One Eagle Street, in the heart of Brisbane’s financial district. It generates a secure cash flow from a host of blue chip tenants, including Minter Ellison, DLA Phillips Fox, Hopgood Ganim Lawyers, King and Wood Mallesons and CBRE. The building has a net lettable area of circa 60,000 square metres and includes 313 car bays. It also offers the largest floor plates within Brisbane’s’ Golden Triangle which range in size from approximately 1,792 square metres to 1,868 square metres. said the building’s premier location and the strength of the tenant covenants were two of the key attractions that would help underpin buyer interest. “Waterfront Place offers outstanding investment fundamentals through its large efficient floor plates, quality tenant covenants, premium location and recent capital expenditure program. It has also experienced a strong level of recent leasing activity in what has been a relatively subdued occupier market," said Mr McIntyre. Waterfront Place also benefits from strong sustainability credentials, with a 4.5 Star NABERS Energy Rating and a 4 Star NABERS Water Rating.